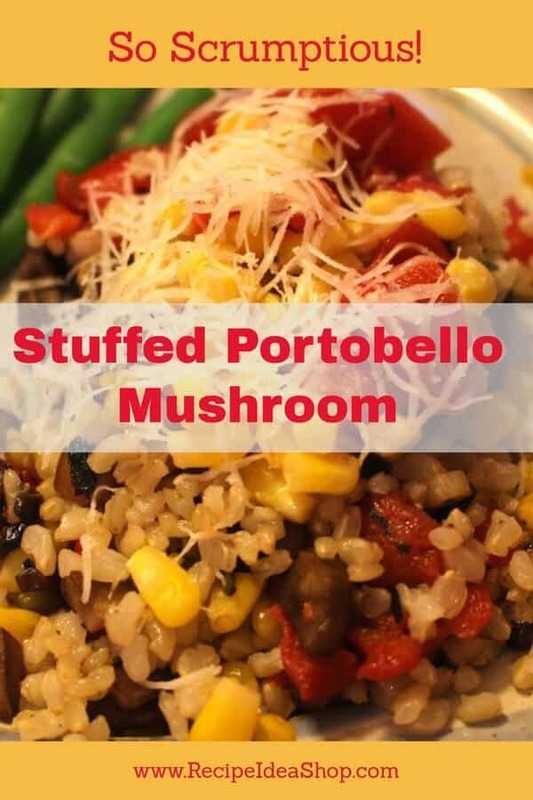 Stuffed Portobello Mushrooms (Portabella) are filled with tasty goodness. Simple and delicious. Stuffed Portobello Mushroom. Vegetarian. Gluten free and fabulous. “What?” said my husband. “No beef? No pork?” “That’s right,” I replied. “I need some vegetarian meals after all the meat we have had the past week.” Hi. It’s Lois in the kitchen at Recipe Idea Shop. 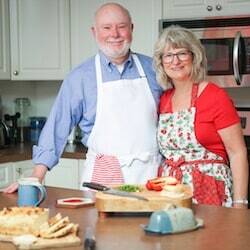 I created this flavorful and filling supper for us yesterday. I love Portobello Mushrooms. 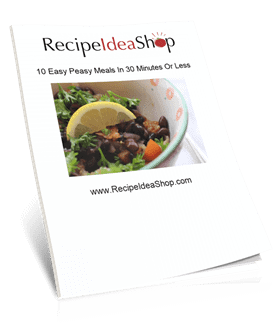 They are “meaty,” full of deliciousness and easy to make. And Don thought they were very tasty. He was only kidding about the meat, but he does like his meat. You see, he’s a Blood Type O (needs meat) and I’m an A (needs vegetables). Luckily, he really eats just about anything and is happy, and so do I as long as the food is fabulous. I used canned roasted red peppers instead of roasting my own, but if you want to make Roasted Red Peppers from scratch, you can roast them whole. Just cut out the seeds from the top, brush them with oil and follow the rest of the Roasted Vegetables recipe. Cuisinart GR-150 Griddler Deluxe, Brushed Stainless. Buy it on Amazon. Wash the mushrooms and pat dry. Heat the olive oil over medium heat until hot. Add the diced mushroom stems and green onions and sauté for 5-8 minutes until mushrooms are starting to brown and onions are transparent. Add the butter, chopped basil, salt and pepper. Mix in the corn, red peppers and rice, and cook a couple of minutes until heated through. 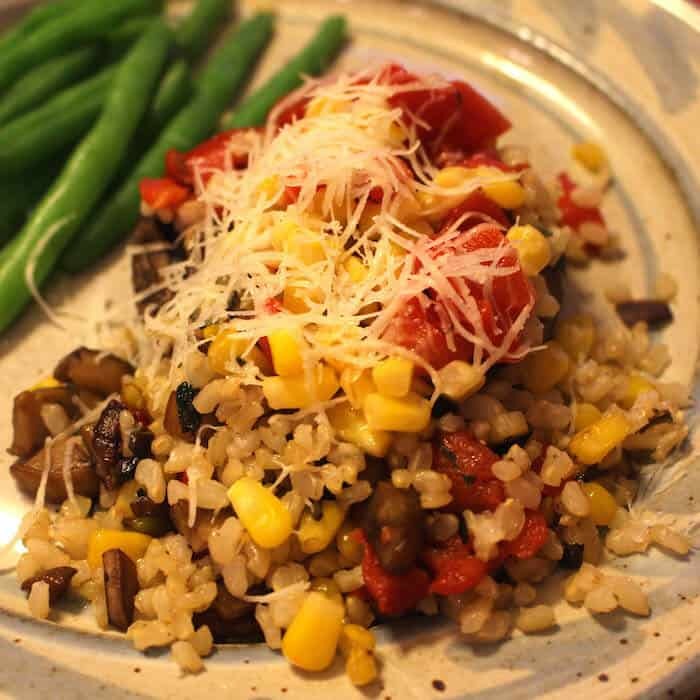 Save a little corn and red peppers to use as a garnish. In the meantime, grill the Portobello caps until tender, 8-10 minutes. I use my George Foreman Grill for this part. When tender and juicy, place the mushroom caps inside up on a plate and top the caps with the rice mixture. Add a little more corn and red peppers to the top for presentation. Finish with Pecorino Romano (or Parmesan) cheese. 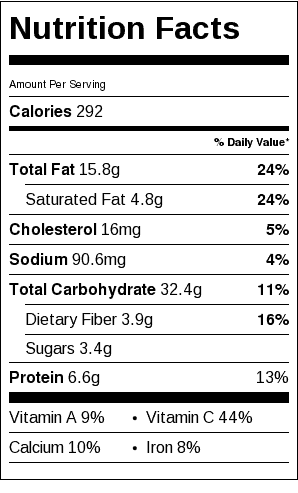 Stuffed Portobello Mushroom Nutrition Label. Each serving is one mushroom cap.